Spray Guns are a widely used and effective means to apply liquids to lawns, turf and gardens. The spray guns available are produced by top manufacturers such as Hypro and TeeJet and are highly efficient spraying units. 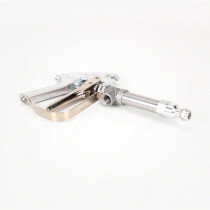 The spray guns here at SpraySmarter.com are offered with a wide variety of spray gun lengths, inlet sizes, maximum pressures, flow rates, and material constructions. This large selection provides for a large amount of differing application needs.